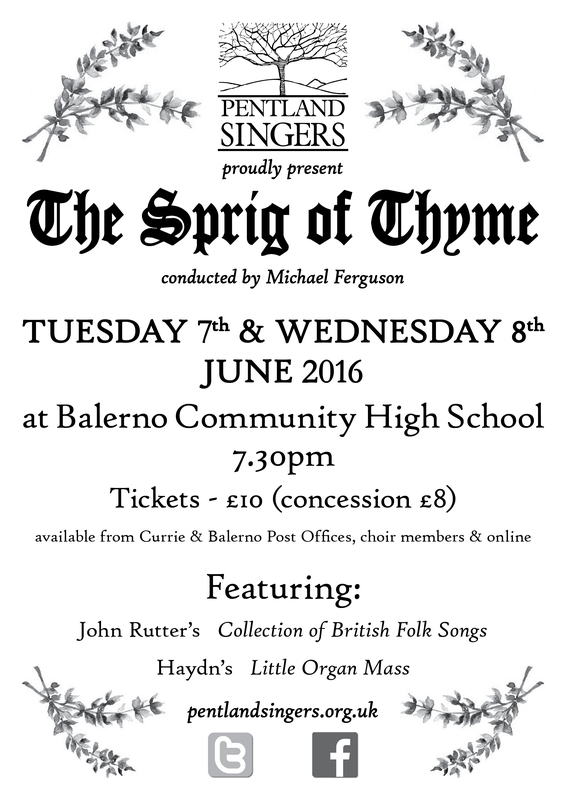 The choir sings a wide range of music, varying from large choral works to traditional, popular and spiritual music. 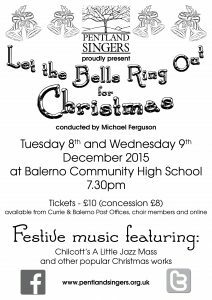 Three concerts are usually performed each year, one summer, one for the Balerno Music Festival and one for Christmas. 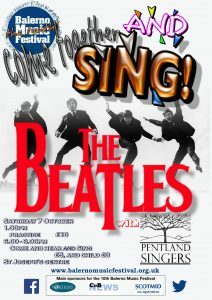 As well as our popular Come & Sing events! These performances are a mix of classical pieces and other works, usually following a theme. Don’t forget to check out our Galleries page for pictures from past concerts and events! 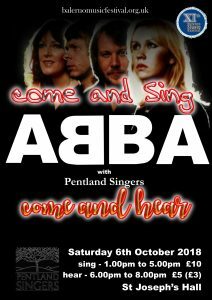 Celebrate the Balerno Music Festival by coming and singing the songs of ABBA with the Pentland Singers! Celebrate the Balerno Music Festival by coming and singing the songs of the Beatles with the Pentland Singers! We are performing in the Swaledale Festival 2017 in a joint concert with the Swale Singers on Saturday 3rd June at 7.30pm in St Andrews Church Aysgarth – singing Puccini’s ‘Messa Di Gloria’. 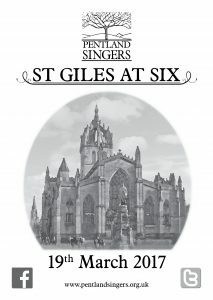 St Giles at Six – come and support us! 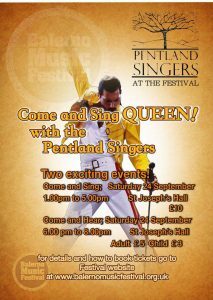 The Pentland Singers & friends “Came & Sang” Queen at the Balerno Music Festival. 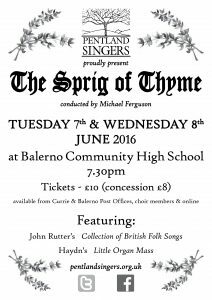 Our June concert featured John Rutters ‘Sprig of Thyme’ and Haydn’s Little Organ Mass. 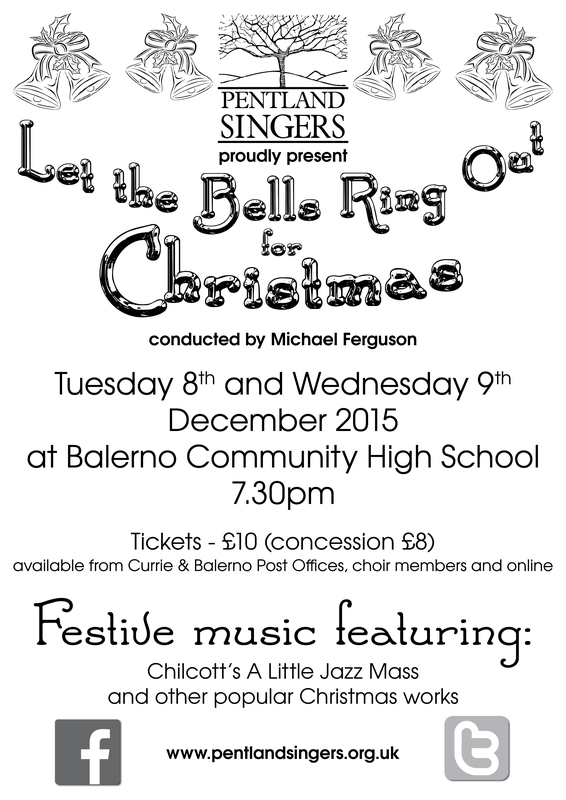 Our Christmas concert this year was entitled “Let the bells ring out for Christmas“. 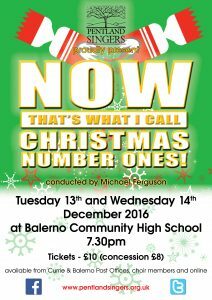 The theme of bells running through the music; it has been lots of fun to select pieces on that theme with the choir choosing the carols. There was a pop song with the bells theme too! Bob Chilcott’s A Little Jazz Mass brought a whole new jazz-groove to Christmas music, but became a favourite for everyone who enjoyed mixing the old and the new at Christmas. 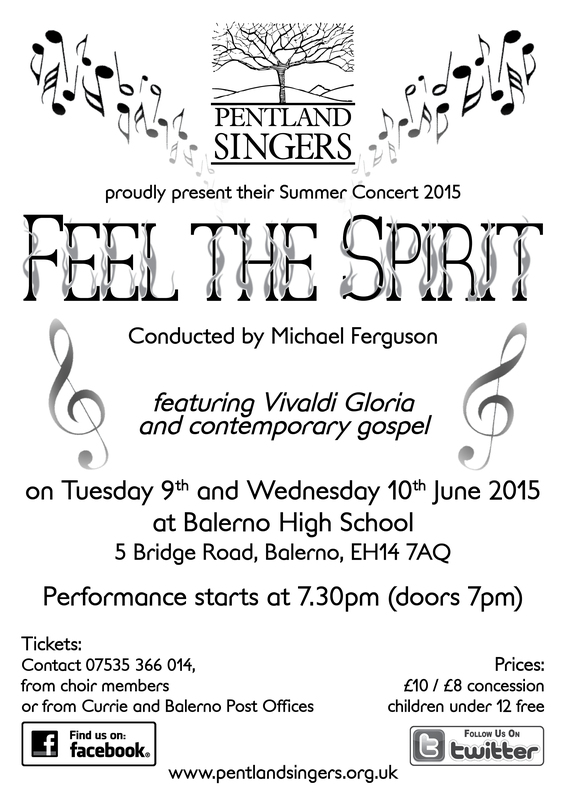 Our Summer concert really got into the “spirit” of things with some contemporary gospel! 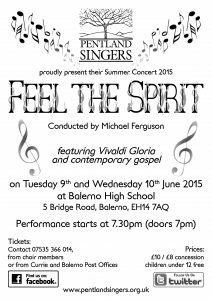 Music and Memories was a free concert in Balerno High School on Thursday June 5th 2014 at 7.30. We celebrated 30 years as a choir by singing a selection of music that we have performed over the years. 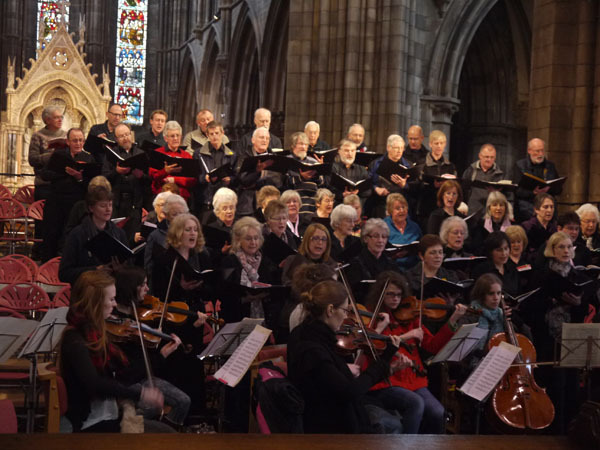 The joint concert with the Swale Singers from Yorkshire to celebrate our 30th Anniversary, took place in St Mary’s Cathedral, Palmerston Place, Edinburgh on March 29th 2014. This was a very successful event, enjoyed by a large audience. The Joint Choir sang the beautiful Mozart’s Requiem, while each choir also performed separately. The soloists for the Requiem were the Watt Quartet, student singers from Heriot Watt University, and the orchestra included young musicians from St Mary’s School of Music. 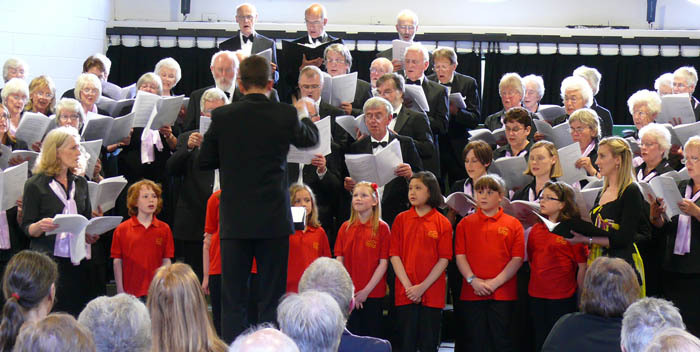 See the report with pictures about the concert provided by the Swale Singers and our own set of pictures in the Gallery. 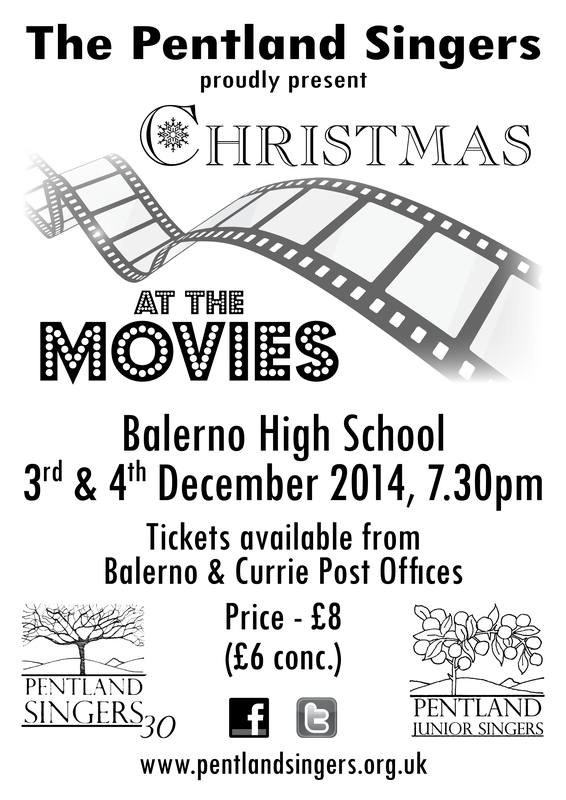 This took place in Currie High School on December 5 and 6 2013 (Thursday and Friday) and marked the start of our 30th anniversary year. The choir performed a selection of some of our favourite seasonal songs that we have performed over the past 30 years. 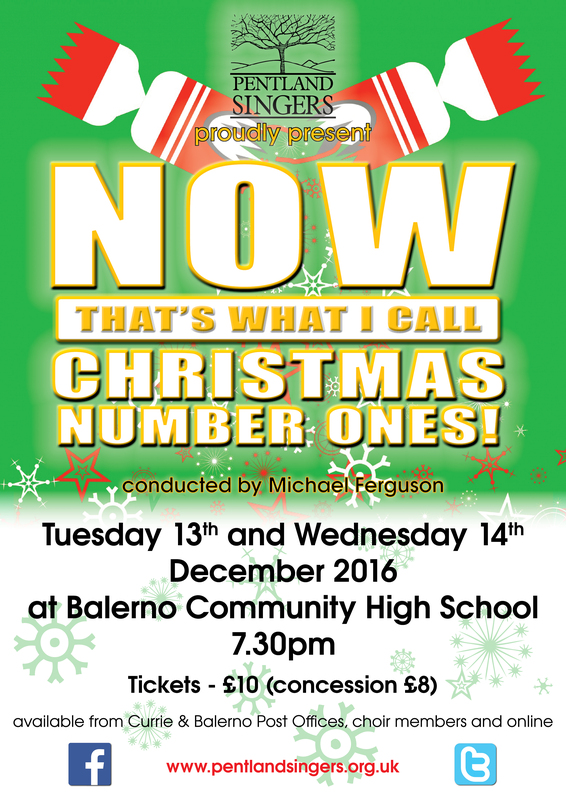 The Pentland Juniors delighted the audience with their contribution, including the Australian 12 Days of Christmas (“An Emu up a Gumtree“)! Our guest performer was Connor Smith, who this year won the Vocalist Category in the UK Final of the Rotary International in Britain and Ireland Young Musician Competition. The conductor was Bede Williams, accompaniment by Justin Nash. 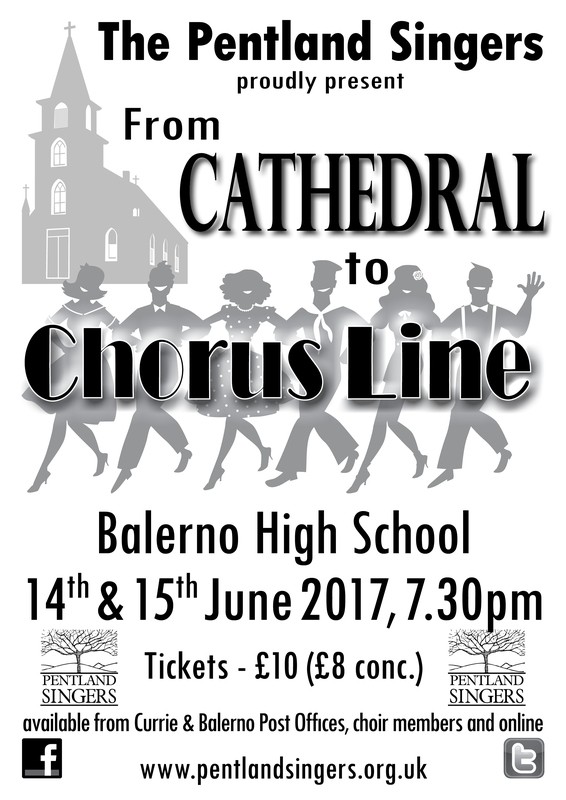 As part of the Balerno Music Festival, the Pentland Singers hosted a Come and Sing event in Balerno Church. 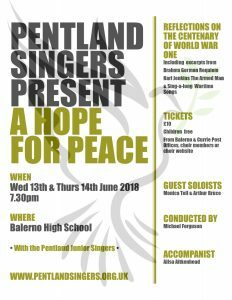 This was directed by Bede Williams, who welcomed members of the Pentland Singers and singers from many other choirs to produce after just one afternoon’s rehearsal, a concert performance of Faure’s Requiem. Accompaniment was provided by Justin Nash on Organ and guest Andy Thorn on Viola and Violin. There were guest soloists, Christopher Nairne (Baritone) and Emily Mitchell (Soprano). Viva la Scotland! 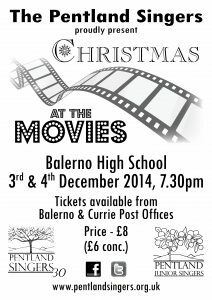 Balerno High School, Weds June 5th and Fri June 7th 2013. 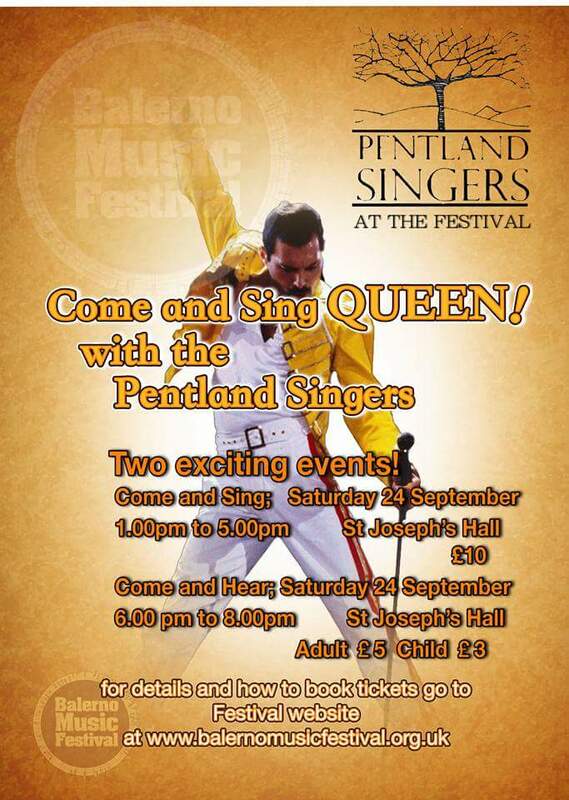 Over the past three years the Pentland Singers have had a wide variety of themes for their Summer Concerts, but sometimes the best concerts to sing and listen to are the concerts that are about things close to home, things that we all connect with. For their 2013 Summer Concert, the Pentland Singers presented ‘Viva la Scotland’ a programme that portrays the rich and diverse musical heritage of Scotland, both old and new. The English composer Cecilia McDowall’s Northlight was first performed in Aberdeen in October 2011. The text by Aberdeen based poet Alan Spence is centered on the idea of ‘renewal’, and the way that renewal is an opportunity for both regeneration and looking to the future. The text is a gritty portrayal of Aberdeen but has a universally appropriate theme of moving from darkness into light – “although what we have now will change, light will always be wish us, renewing itself endlessly”, the composer writes. Ubi Caritas by the Welsh born but now Aberdeen based Paul Mealor, was commissioned by Prince William for his 2011 Royal Wedding. It is a revised setting of Mealor’s Now Sleeps the Crimson Petal that was first performed in St Andrews in 2010. 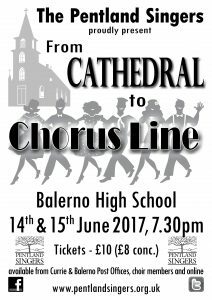 Both settings are sublimely beautiful, perfectly portraying the meaning of the Latin ‘ubi caritas et amor’, or ‘where charity and love are’. The programme also featured music of Scottish composer Cedric Thorpe Davie to mark the composer’s centenary year, as well as All in the April Evening by Hugh Roberton, founder of the Glasgow Orpheus Choir. Mixed in with this composed music were many traditional Scottish tunes, given spectacular choral arrangements by the likes of Ken Johnston and others. 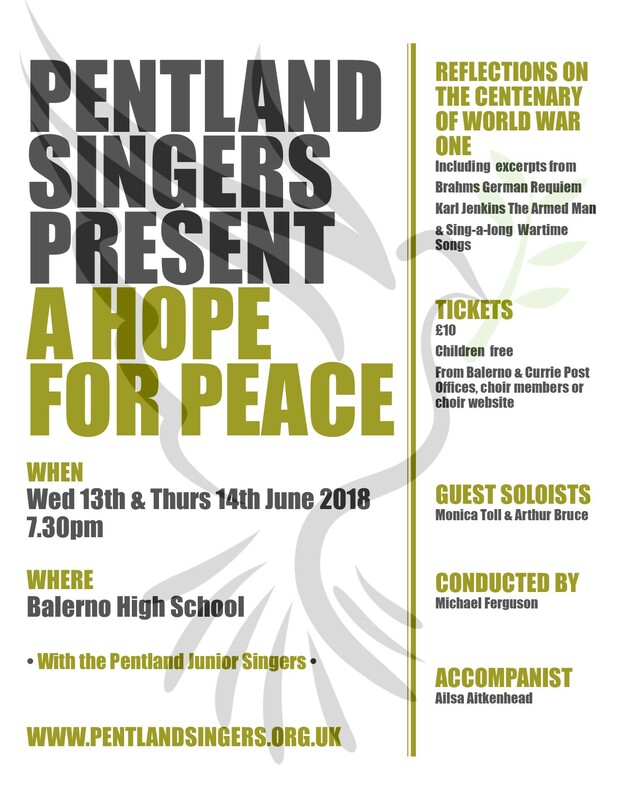 The concert also featured The Pentland Junior Singers, solos from Jessica Leary and a selection of Scots poetry written and read by Eileen Chadwick. Our accompanist was Justin Nash and of course our Musical Director is Bede Williams. Melodies and Musicals, Thursday March 21, Currie High School, a programme featuring the musicals of Rodgers and Hammerstein and jazz standards such as ‘Fly me to the Moon’ and ‘Misty’. The accompanist was Justin Nash, and guest artists were Ara Grigor and Connor Smith. The Junior Singers also made their contribution.